As founder of the Orange Springs Retreat Center, Mike Sokol has been involved with Florida event planning and hosting since 2003. Mike and his wife Sarah operate the Retreat Center and will gladly accommodate your group and discuss available dates. Orange Springs Retreat Center offers nutritious meals, cooked by “Clarence” who has been with us for more than 30 years. He is on staff for all of our weekend and week-long retreats and can help customize your retreat group’s menu. We provide retreat groups with all meals, lodging, and exclusive use of the entire facility for a flat per-person rate. This includes access to all meeting rooms, bonfires when requested, use of our canoes and paddle boats, and much more. Our ropes course, boasting high elements with zip-lines, can be made available upon request. Our resident facilitator will be happy to discuss pricing based on the size of your group. After studying at the University of Florida, Mike worked in advertising for just two years before he purchased the land his parents had used for their 8 week children’s summer camp. Mike then founded, in 2002, a full time Florida Retreat Center in that he named The Orange Springs Retreat Center. While the summer camp program still runs to this day, Mike had it shortened to 7 weeks to offer more time for group retreats to enjoy the Florida retreat center. At that time, Mike began an ambitious renovation campaign that included building a ropes course with both high and low elements(including duel ziplines!! ), adding a new dock, porches on all 12 buildings, adding meeting spaces for lecturing during seminars, and developing a menu with his chef more conducive for adult group retreats. Since then, the effort payed off as Mike Sokol now caters to a constant flow of weekend and weeklong retreats from Corporations, Churches, Fire Cadet Training, Seminars, Sorority Weekends, and just about any organization looking for a place to host their Florida retreat. He is always happy to help groups book their next retreat at the Orange Springs Retreat Center. Mike married Sarah Sokol in 2009 and though she sometimes involves herself in retreats, her main focus is working with the children’s summer camp that Mike’s Mom Shelley founded back in 1971. Although the Orange Springs Retreat Center does not design the programs for our retreat groups, Mike is always happy to help retreat group leaders as they organize there many different types of group retreats. Feel free to ask for him by name! Shelley and Big “D” Sokol have been involved in camping since 1971, long before Mike ever dreamed of running a Retreat Center. 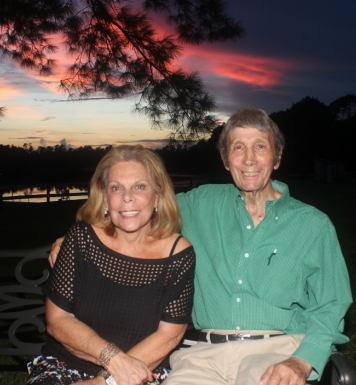 They also enjoy coming out to the Orange Springs Retreat Center on occasion to either meet the different groups or just take in the serenity of this beautiful Florida retreat Center for themselves. Big D has a big birthday coming up at 90 years young! He still enjoys walking up and down the dirt road that leads into the Orange Springs Retreat Center. When Shelley and Big D are around to meet the different groups, they are full of pride in what their son Mike has created over these last 15 years! !